Keep Our NHS Public have long voiced our concerns about Matt Hancock’s appointment as Secretary of State for Health, one of our primary concerns being that he has publicly supported the role of private tech companies in the NHS. A recent sponsored supplement in the Evening Standard (paid for by private technology company Babylon) caused the Labour party to demand the Prime Minister launch an enquiry into whether he has breached the Ministerial Code. Hancock has voiced his support of the app GP at Hand since his appointment. 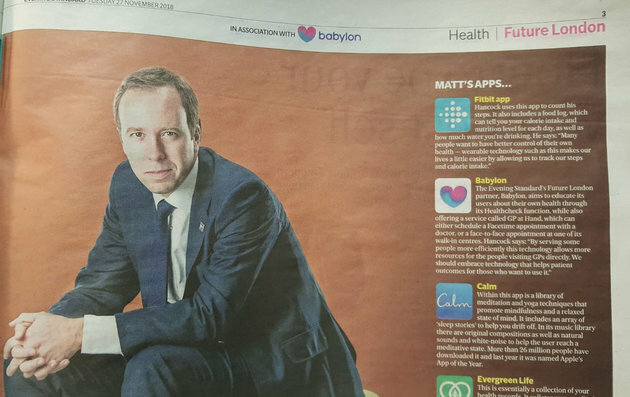 He has spoken at Babylon (the private company who provide the platform for GP at Hand) head offices and called the app ‘revolutionary’ in a Telegraph article. This is the latest incident that highlights how dangerous he could be to our NHS. Health campaigners, the BMA and GPs have all spoken publicly about the dangers of embracing and promoting GP at Hand. 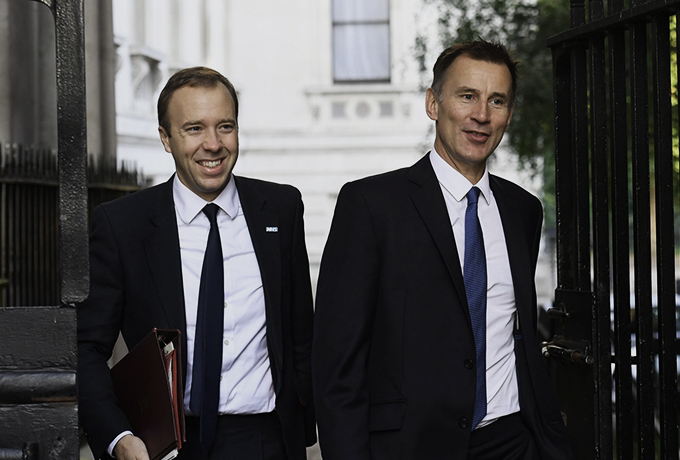 It is a pity that the new health secretary has not acquainted himself with the fact that widespread concern has been expressed by GPs with regard to the model of GP at Hand. We are not Luddites and embrace innovation when it is evidence based. NHS general practice has been at the forefront of developing technology in the health service. However, GP at Hand introduces a new version of Tudor-Hart’s inverse care law in that it improves access for the internet savvy at the expense of those less technically literate, the latter tending to be the older and sicker. I hope that this does not signal his (Hancock’s) general approach, as I hope that we will be able to work with him to the benefit of all who use the NHS not just one cohort. As she succinctly points out it is not that KONP and other organisations critical of Babylon and GP at Hand are against technological innovation in the NHS but rather that GP at Hand undermines GP practices, cherry-picks patients and drains money from existing GP surgeries. We have a leaflet available from our shop should you wish to campaign on the issue in your local area. If you’d like to read more in depth about Hancock and GP at Hand our Press Officer, Samantha Wathen, has written a brilliant piece for the KONP website entitled Hancock risks breaching ministerial code, backs Babylon and rejects science. KONP is a non-party-political organisation but we all know that it’s in our interest to engage with all parties that that have influence in local and national government. Terry Tallis and Keith Venables, two members of KONP Executive, are offering some background ideas on how to attempt to influence political parties. This first one is about MPs’ surgeries. The second will report on various parties’ views on the NHS. There are 650 MPs. Most of them hold surgeries in their constituency to give people an opportunity to meet them and discuss matters of concern. MPs usually hold surgeries once a week and advertise them locally or online. They only take up issues from their own constituents. 1. First, decide what you want to lobby your MP about: it’s probably best to take up either a key local issue, with local colleagues, or to choose a subject that is being debated nationally – such as the NHS Reinstatement Bill. 2. Find out when and where they hold surgeries: they are often on Fridays or Saturdays. This information is usually inline. 3. Find out (if you don’t already know) what party they represent and what their published views are on the NHS and on the issue you are raising. Do your homework. It makes all the difference. 4. It’s worth saying that MPs will vary massively. Many Labour MPs will be sympathetic to your views, some will not. Very few Conservative MPs will agree with you but some may. Whichever party represents you (including Green and Lib Dem MPs), find out where they stand. 5. Choose a surgery which you (and perhaps some friends from the same constituency) can attend and make an appointment. Just before you attend, write a carefully crafted short letter and send/email it to your MP. Decide what outcome you want. 6. Take a copy of your letter to the surgery. When you lobby, present your letter and focus on the outcome you want. For example, it might be to vote a certain way. Be clear and ask your MP will they vote that way or not. 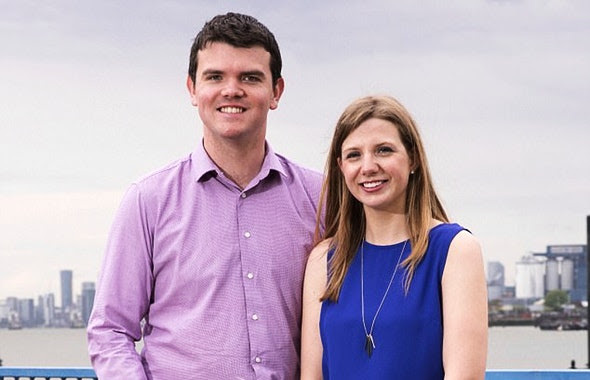 The KONP office hope to update the Resource Cabinet area of the website with Terry and Keith’s advice for making politics work for health campaigners. We will keep you updated. 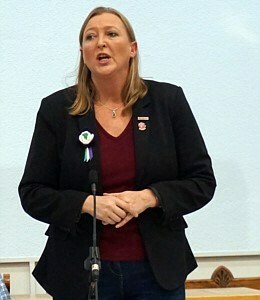 On 24 November 2018, around 50 NHS supporters and campaigners came together in York public library for a book launch. 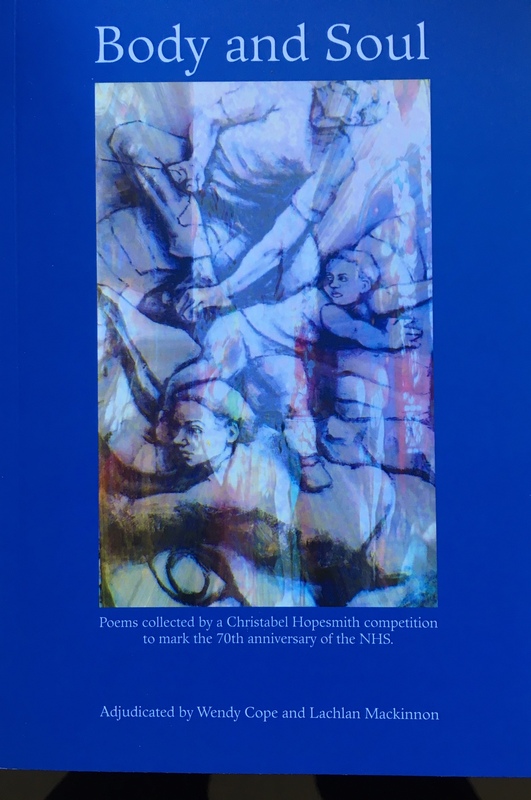 Body and Soul is an anthology of poems collected through a competition to celebrate the 70th anniversary of the NHS. Several poems were read by contributors – deeply moving, sad, and funny in turn. An insightful speech given by Deborah Harrington of Public Matters focused on how the NHS is being steadily dismantled and how this has to be opposed. Members of York Defend Our NHS and Leeds Keep Our NHS Public performed a short play on the history of health care in York, celebrating the massive achievement of creating a national health service immediately after World War two when a bankrupt nation grappled with rebuilding a fairer society. health workers waiting for admission to this official event. Body and Soul is published by Whitelight Press, Otley, and can be obtained for £8.00 by contacting Christine@northkirkleesnhssupportgroup.org. The poems will inspire all those who love the NHS to fight even harder to reclaim it as a public service of the highest quality. Whistleblower Dr Chris Day has released a statement explaining why he had to pull out of the legal hearing and agree a statement with the health organisations. Faced with an unacceptable financial burden should he have failed in his legal case, he had no choice. We repeat our congratulations to Chris on his success in winning battles on behalf of 54000 junior doctors in a previous legal case. In this he protected junior doctors’ rights by forcing Health Education England to recognise their employer’s responsibilities to junior doctors, including whistleblowing protection. You can read Chris’ statement here. 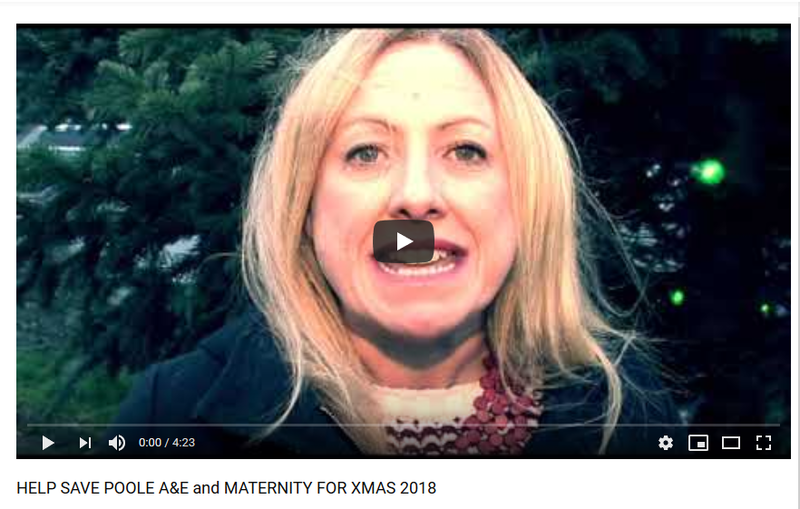 Keep Our NHS Public Dorset have made a great christimas video urging people to help campaign to keep Poole A&E and the maternity services open and give themselves the best present for 2019. Through the video they show that a report by the South Western Ambulance Service found that 396 people would have been at much greater risk if they had had to travel a further 19 minutes to Bournemouth A&E. On 17 December a health committee will meet at the Civic Centre to decide whether to refer the plans to close Poole A&E and maternity to Secretary of State for Health, Matt Hancock, for a final decision. You can join them in protest and see more of their wonderful videos via their website. The Centre for Health and the Public Interest is hoping to raise £100,000 to provide them with the resources they need to ensure they can maintain and strengthen the public interest perspective on UK health and social care policy. They are hoping to find 1000 people to give £100/year to make this possible. The aim of the Centre, as laid out on their website, is to subject current policy to careful, evidence-based critical scrutiny; to explore alternative solutions to the challenges of providing universal high quality health and social care; to promote greater democratic determination and accountability in the organisation and delivery of health and social care; and to advocate for probity, integrity and transparency in health policy-making. You can watch their video about why you may want to support them on YouTube and read more about the campaign on their dedicated page. 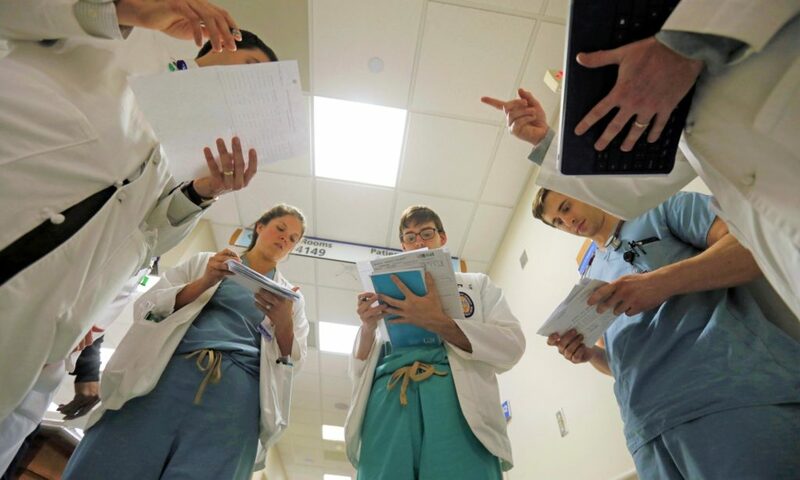 The BBC reported on the responde of over 60 consultants and senior doctors to the Gloucestershire Hospitals NHS Foundation Trust’s proposal to move emergency and inpatient general surgery from Cheltenham General hospital to Gloucestershire Royal Hospital, seven miles away. To get involved with the campaign in Gloucestershire please head to the Gloucestershire/Stroud Against the Cuts website. 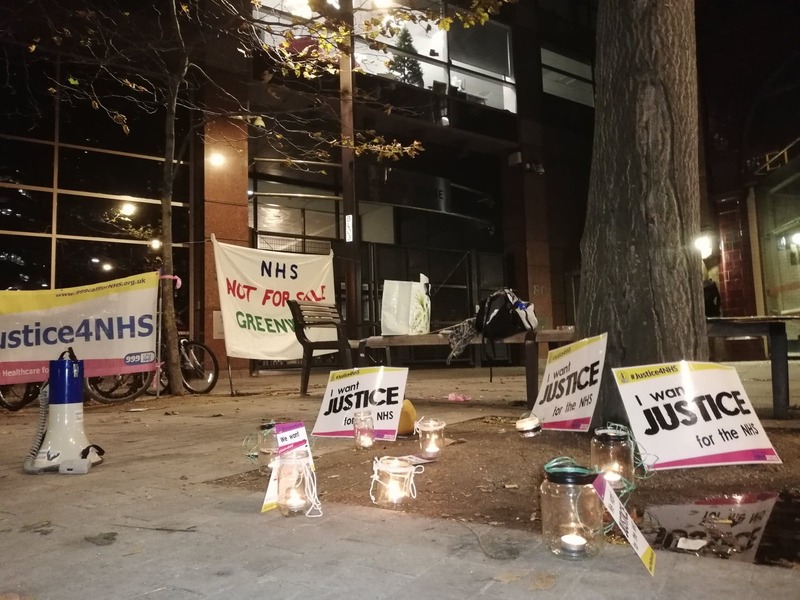 In late November campaigners from Greenwich KONP spent an evening outside NHS England’s offices in Elephant and Castle where they held a vigil for the NHS and handed out leaflets to staff and passers-by. The location meant they attracted a lot of attention from the general public and provided great publicity for the Justice4NHS campaign in particular. If anyone is interested in joining them in potentially making this a monthly event you can get in touch with them by searching on our local group page. Our barrister finished up with more excellent points, then at 4.40pm the three judges announced they were reserving judgement. They thanked our team for a very clear and well presented case and also thanked the campaigners in the courtroom for their attendance and recognised the public interest in this case. So… no second day in court. Initial disappointment at not having a second day in court has given way to genuine bemusement – we don’t know what the judges are thinking, so we should not try to second-guess, and we just have to wait for their judgement which may be after Christmas. 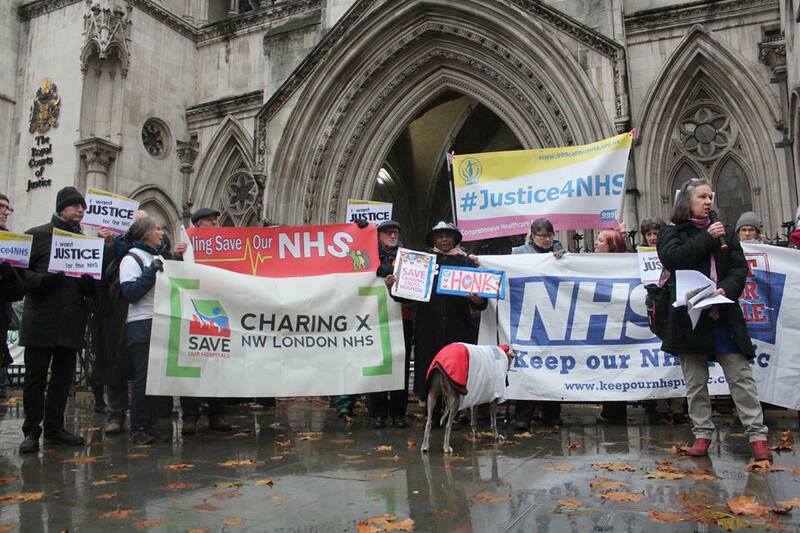 Thank you so much to campaigners, KONP members and others, for demonstrating their support of Justice4NHS on the day. Ealing, Hammersmith & Charing Cross, Lambeth, Lewisham and Greenwich where some of the local groups who came out in support. Well done to 999 Call for the NHS for all their hard work bringing this to review. We await the court’s decision. The Health Campaigns Together organised conference in Birmingham on the 17 November was a great success. Speakers included John Lister from HCT and KONP and Eleanor Smith MP, the propser for the NHS Bill along with campaigners from the Relatives and Residents Association, North West UNISON Dignity in Care Campaign, ‘Being the Boss’/Reclaim our Futures, National Pensioners Convention and the Centre for Welfare Reform. It was clear from the conference that there is a common basis for a campaign for a publicly funded and provided social care service that respects the individual needs and capacities of all citizens. A follow up meeting is scheduled for 13 December. For links to videos from the day and for a full write up of the event please have a look at the Socialist Health Association website. Rethinking healthcare: what next for the NHS? The Guardian have organised a panel including Sir David Nicholson, former chief executive of NHS England;Christie Watson, author of The Language of Kindness and former nurse of 20 years; and chair Denis Campbell, Guardian health policy editor, to discuss the future of the NHS. We have updated our support us page so that it is easier to use and clearer for new members and you can now also set up a one off payment or direct debit via Go Cardless rather than PayPal. Please visit our new and improved page here and get in touch via nationaladmin@keepournhspublic.com if you have any queries. We have got a new batch of NHS for Sale books available from the office and a fabulous bunch of new leaflets! Please have a browse and order via our shop. Sack Hancock. He is no good for our taxpayer funded NHS! When I was sharing the bad news about the NHS to some fellow-pensioners, they were appalled. They want to know why adverts aren’t in newspapers and why TV and radio aren’t featuring it more. Social media isn’t their forte. Any comments?